Indians who do not follow any other sport other than cricket would look at the above picture and just ignore it because it looks like a picture of some rural landlord with his goons. Tamil film lovers will see this picture and say "Hey that is the Villain - Super Subbarayan" from Komban movie. But those who have followed Indian football closely will immediately spot the man in red shirt in this picture. 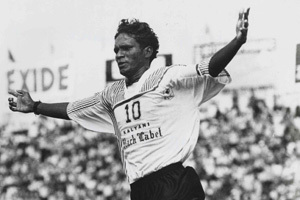 He is I.M Vijayan - the greatest footballer India has ever seen. India has done good in football in the past. We have come 4th in the 1956 Melbourne Olympic games and we were also the best team in Asia in the year 1962. Yes! We were far better than the Koreans, Japanese and the Chinese at that time. What forced me to write this post is the numb feeling that I got after watching India's pathetic display against Guam in the world cup qualifiers. Guam is a country that has a population that would fit inside the Salt Lake stadium where India was beaten by Guam 2 goals to 1. We boast of Indian Football league, the Bhutias and Chetris who have played for European clubs but still we find it difficult to play good football even with countries like Guam. It was the year 1999. India was playing Bhutan in their second league match in the SAF games. I was sitting in front of the TV. Narottam Puri was commentating in Doordarshan. India were on a high after toying with Pakistan in their first league game in which they won 5-2. Vijayan had scored a hat-trick in that game. When the referee blew the whistle to kick start the game against Bhutan, I just went to another room to take a biscuit packet. It would have just taken some ten seconds. When I returned to watch the match the goal score read India -1 , Bhutan - 0. They were showing replays of the goal scored by Vijayan in the 12th second of the match. It was a world record for the fastest goal scored by any team at that time. He went on to score another hat-trick in that match. Years later, India invited some foreign teams to play in the Nehru cup which was supposed to be the biggest football tournament in India. India became the champions in 2007 and 2009. This was because India invited minnows and some how managed to struggle and win against them. The earlier editions of Nehru cup featured some good football teams and players. The tournament in 1993 saw the mighty Cameroon making its visit to India. Cameroon had shocked the Argentinians and went till the quarterfinals of the 1990 world cup. Can we ever forget Roger Miller's dance moves? When India faced Cameroon, we were expecting Cameroon to drub India. But India managed to draw with the mighty Cameroonians. I M Vijayan's long range goal in the match against Cameroon is still one of the best goals scored by any Indian in the International football scene. If I M Vijayan had been in some other country, he would have been the football manager of that country. In our country he received the prestigious Arjuna award; but on the career front he is acting in small roles as a henchman for the villain in some Tamil movies. Limelight is always given for people who play for foreign clubs; but a player of the standard of I M Vijayan is not given the role that he deserves. How many of you remember Chunni Gowsami, Bikas Panji, Raman Vijayan, Pappachan, Aqueel Ansari, Carlton Chapman and Bruno Coutino? They are the Romarios, Messis, Ronaldos (The Brazilian) and Beckhams of India. They are already forgotten by many. It was a treat to watch them kicking the ball around and it was a treasure to watch I M Vijayan moving around the field with the football. He is indeed the Pele of Indian football. Sad that the present day youngsters don't get to watch them all in action. May be, Doordarshan should do a re-run of some of these games to revive the old magic these guys left us with. When Maradona visited India in 2012, he shared the stage with I.M. Vijayan. He even told Vijayan that he admired Vijayan's style of game play. Getting the attention of the "Hand of god ;) " is not a joke. This video of Vijayan and Maradona always gives me goosebumps. Podi pasanga kita thotutanga, after a decent show against Oman. Next two matches very tough. Today's loss should single handedly be borne by the poor midfield and that bozo Robin Singh who is too slow for International football. Next two matches dharma adi waiting. Elorum post I League hangover la irukangalo?